Every day that we’ve been in our Arizona house, it feels more and more like home. Last year, I talked about our first winter in Arizona in “Home is Where the Heart is”. This year, we arrived in Arizona in late January and did not leave until May 1st. In October, when we traveled through Israel, we purchased an original painting from a local artist and a handmade copper platter, both of which are now displayed in our Arizona home. This is something we have done with other items over the years. When we travel to foreign countries, we always like to bring back something unique and display it in our home in New York. Now we have begun buying items with our new home in mind. Adding these items of personal significance to our house in Arizona helps make it feel more like home. 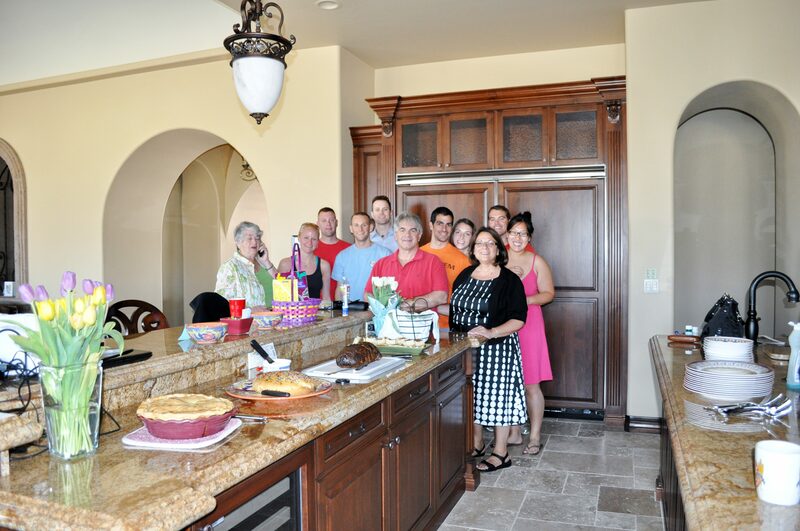 Most of all, sharing our house in Arizona with family is what ultimately makes it feel like it is our home. Our first family visitors were Matthew and Erika along with Erika’s parents and sister. They arrived for a long weekend in late March so that we could all celebrate Matthew and Erika’s First Wedding Anniversary. That was a very special weekend! 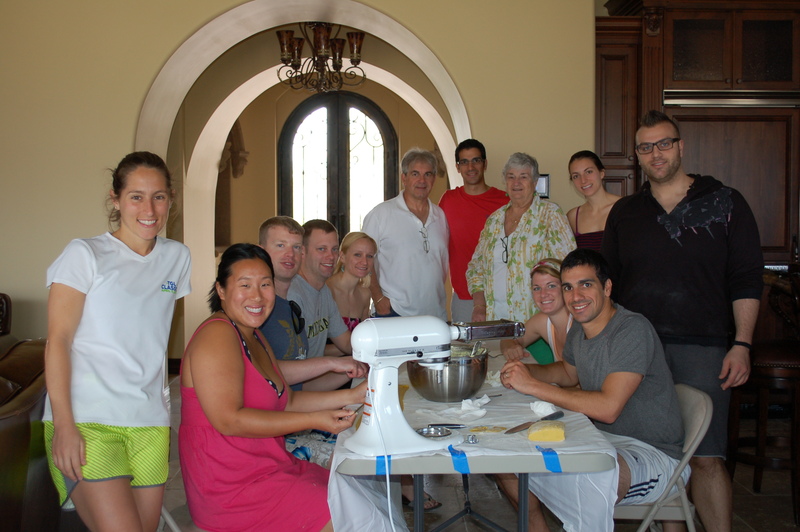 We all gathered together to prepare and enjoy meals and, of course, spend time at the pool. We visited a couple of nearby places and generally just enjoyed each other’s company. We have all become one big, happy family. Only a couple of weeks later, it was Easter and we were lucky to have all four of our children join us along with significant others. Julia came from Syracuse, Joseph came from NYC, and Matthew, Erika and Michael came from San Francisco along with a group of their friends. My Mother also came from Florida. In all, there were fifteen of us for the weekend. For a few days before everyone arrived for Easter, I cooked and baked in preparation for the weekend making all of our traditional family recipes. 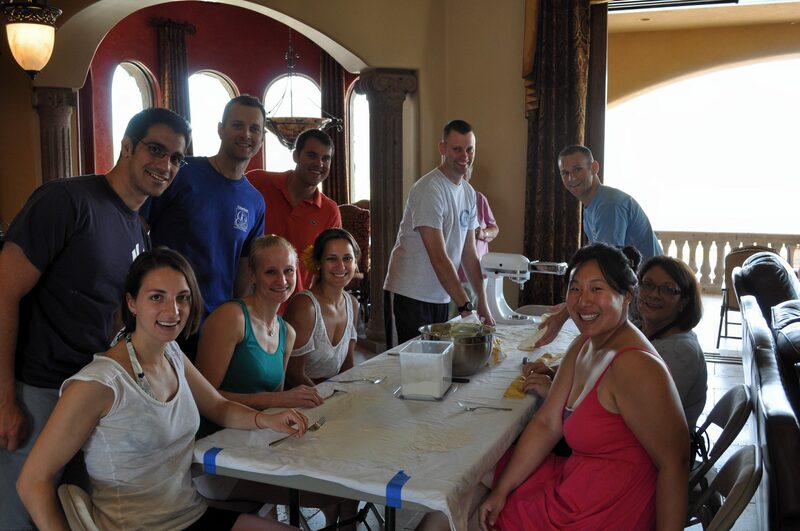 Just like last year, we put everyone to work on Saturday morning making dough for homemade ravioli and then spent a couple of hours putting them together for Sunday’s dinner. 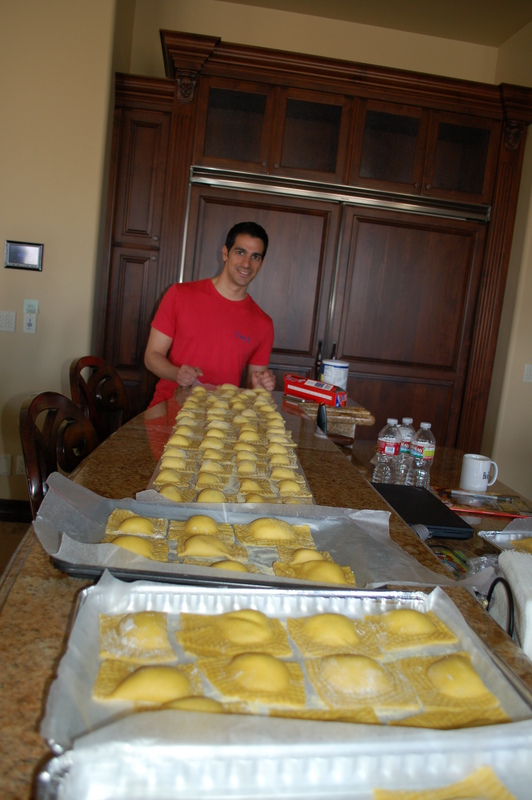 Everyone loves the process and because of the team effort, the ravioli tastes that much better. This year, I will share my family recipe for Easter Meat Pie as well as some pictures from the weekend. The recipe goes back, at least, to my Mother’s Grandmother. A. Sift the dry ingredients together. B. Blend the shortening into the sifted dry ingredients with a fork. C. Mix the egg with the cold water and add to the flour mixture until a ball is formed. D. Refrigerate the dough for at least one hour. A. Brown the sausage meat and set aside to cool. B. Combine the ricotta and Romano cheese. Add two eggs, one at a time, beating after each egg with a wooden spoon. C. Add all other ingredients and blend well. The meat to cheese ratio is a matter of personal choice. Blend in as much cheese as desired for the amount of meats used. A. Divide the dough into two portions for the top and bottom crust. B. Roll out enough of the dough to line a deep pie pan (approx. 2 inches deep and 10 inches in diameter) with the dough. C. Pour the filling into the lined pan and cover with the top pie crust. Trim the crust, leaving a ½ inch overhang. D. Fold the overhanging dough under and back to flute thickly. E. Cut slits in the pie to allow steam to escape. F. Lightly brush the top of the crust with beaten egg whites before putting the pie into the oven. G. Bake in a 400◦ preheated oven for fifteen minutes, then lower to 325 degrees and continue to bake for 45 more minutes. H. Remove from the oven. Let stand for 5 minutes. Can be served hot or cold. On Monday, Joe offers a better alternative to the trial of the 9/11 terrorists in “Our Greatest Virtue Is Also Our Greatest Folly”. Our house in New York has been our family home for 24 years. It is essentially the only home our children know. We knew that when we built our house in Arizona that it would someday also be our home. Would we ever feel comfortable in two houses? Our first winter in our Arizona home is now a memory and we look forward to many more memories there. Much of our time in the last three years was spent supervising and agonizing over the building process of the house. Over the last year, we worked with Stephanie, our interior designer, to select furniture, window treatments and other furnishings. We took pictures of the progress and imagined what it would be like to eventually live there. Little by little the house took shape. When we first arrived there in January, it still seemed like we were visiting the house just as we did during the building and decorating phases. On the first weekend we arrived, our three sons and significant others were there with us, but by Monday, we were on our own. In January and February we started getting used to this house and its little quirks and creaks, but almost every day, someone had to come to fix or tweak something. Because we were living there full time, we noticed more things that needed to be fixed. Almost everything in the house is new, but in some cases we purchased items for this house that were identical to things at ‘home’. Little things like the coffee maker, the stand mixer and framed family photos to name a few. That helped build a sense of security and familiarity for us as we settled in to our new environment. Every day, there were new sounds, new dishes, new pots and pans, new morning routines and a new style of living. Just when we started to develop a routine and felt more comfortable, we left for a two week trip. We no sooner returned from that trip and had to go home to New York for our son’s wedding. Upon returning in April for a month, we had company for nearly the entire time until we left in mid-May. I think this time period was a turning point for us. 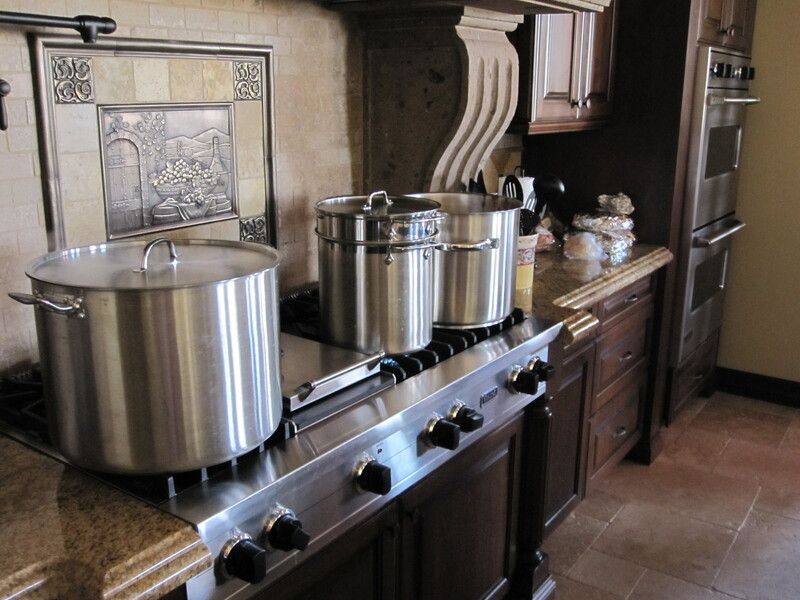 All of the entertaining we did with family and friends really made the kitchen feel like mine. I have heard the saying that ‘the kitchen is the heart of the home’. I believe it. 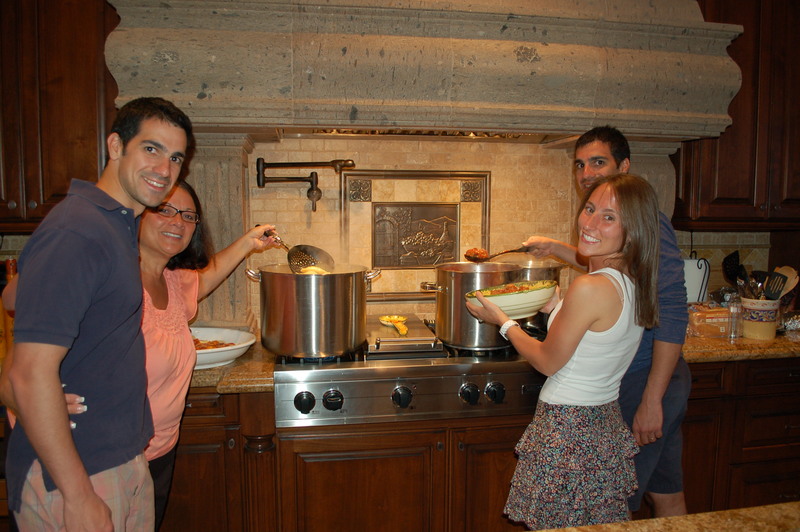 To me there is nothing more rewarding than cooking and feeding everyone! It must be the Italian in me. My mother visited and stayed through Easter. 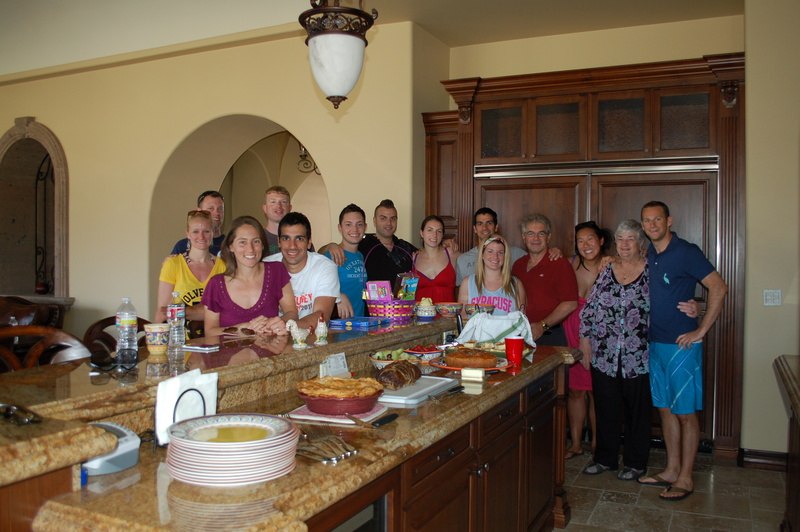 On Easter weekend, our son Michael along with his girlfriend, Jacque and 7 more of their friends joined us. I cooked and baked all of our traditional family dishes for several days before their arrival and we enjoyed wonderful food all weekend, but the real treat was on Saturday morning. Twelve of us did what usually our family of six does each year for Easter. 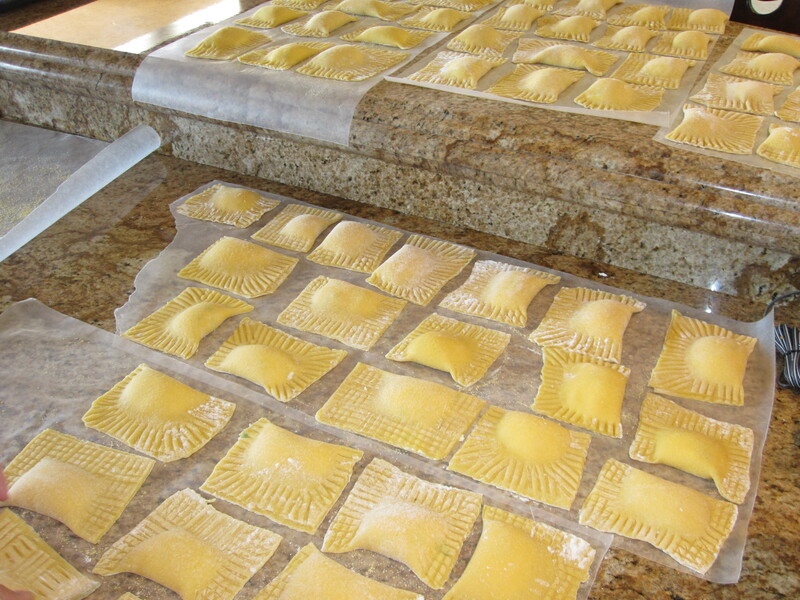 We made home-made ravioli, 185 of them to be exact! Our doubly long assembly line gave everyone a task and the process was flawless. Of course, we had to adapt to our new environment and a larger team, but suddenly, we were at home. Creating a holiday memory with this large extended family all weekend, helped make the house feel like a home. 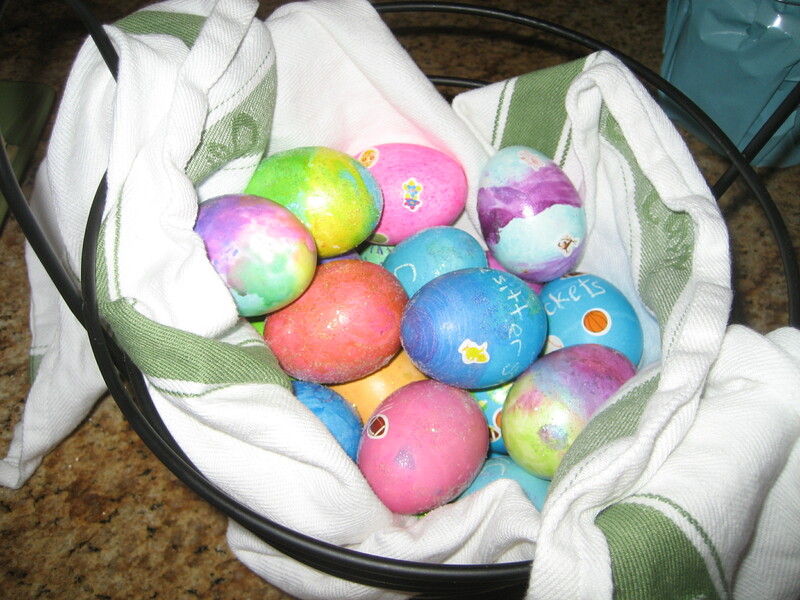 The ’kids’ even dyed Easter eggs later that day. The weekend was so much fun! A. Divide the dough ingredients into two equal amounts and make the dough in two batches. Beat the eggs and water in a large bowl. Add flour until the dough is stiff and slightly sticky. Turn the dough out of the bowl on a counter, board or table and knead for 5-10 minutes. Cover with a towel and let stand for 30-40 minutes. B. Thoroughly mix the filling ingredients in a large bowl. C. Cut the dough into uniform pieces and run through a Pasta Roller Machine (electric or mechanical) three times until you reach the desired thickness. After each pass, fold the strip in thirds and then place through horizontally. D. Drop about 1 Tablespoon of the filling along the middle of the strip and fold the strip over itself. Cut evenly between each one. Carefully seal all of the edges by crimping with a floured fork. E. Cook fresh or freeze. Note: When freezing, place in single rows in a cookie sheet (without over-lapping) on wax paper and corn meal so they do not stick. Partially freeze, then place in a large sealed freezer bag and return to the freezer (depending on size, usually 12 to a bag). After Easter weekend, some good friends from home visited for a few days, we went to Las Vegas with them for two days and then my best friend came to visit for two days. Finally, Matthew and Erika joined us for Mother’s Day weekend. Our daughter, Julia surprised me that weekend too and then spent the last week with us because her final exams were over. She needed the rest after a tough semester. It was the perfect way to end our time in our new ‘home’. Julia is our youngest and she is the most resistant to a new home, but after moving the furniture around in ‘her’ room and helping pick out a large urn with flowers for the Great Room and some decorative sconces for the mantel, even she had to admit that it was starting to feel more like home. After all, ‘home’ is where the heart is!